Fitting out a small boat? 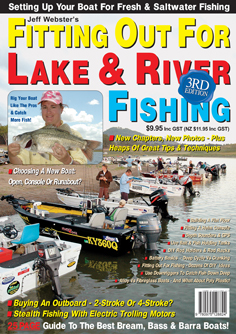 Then grab a copy of Jeff Webster's Fitting Out For Lake & River Fishing. The latest, third edition of this informative, full colour 116 page magazine is a great reference source for anyone fitting out a small tinnie or bass boat. First published in 1999, and again in 2002, the third edition of Fitting Out For Lake & River Fishing has been completely revised and updated with new photographs, more chapters and greater detail. The magazine is the ultimate guide to anyone interested in buying or outfitting an alloy tinnie or open boat for freshwater and estuary fishing. Inside there are chapters on a wide range of topics - including fish finders and GPS, rod holders and rod racks, using a downrigger, electric trolling motors, building a floor, fitting a side or centre console unit, live bait and fish holding tanks, bait cutting boards, battery types and maintenance, and more. Each chapter is illustrated with a dozen or more colour photos detailing all the best techniques and ideas for fitting out a small boat for fishing - be it a 3.0 m alloy car topper, a 5.0 m runabout, or a 6.0 m deluxe bass rig. For new boat buyers, Fitting Out For Lake & River Fishing contains comprehensive chapters on buying a new boat, outboard engine and trailer. Open boat or side console? Vee hull dinghy or barra punt? 2-stroke or 4-stroke outboard? Keel roller or multi-roller trailer? These and many other questions are addressed in a series of chapters aimed at helping newcomers get into the right boat package for their favourite fishing activity. Complimenting the chapters about buying a new boat is a 25 page boat buyer’s guide section containing reviews on the boats produced by Australia's best small boat manufacturers and distributors. 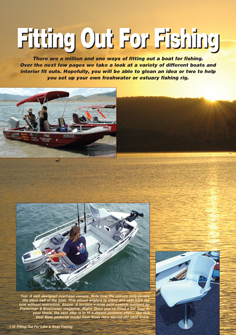 In this section you'll find everything from small fishing kayaks to inflatables, alloy car toppers to fibreglass bass boats, custom plate alloy rigs to poly plastic boats - a wide range of different boat types to suit every small boat fishing situation. If you're thinking about updating, or buying your first boat, then this section will prove invaluable. Fitting Out For Lake & River Fishing is a complete guide to buying and setting up a small fishing rig. No other publication contains as much detailed information and advice on the subject of small boats and small boat set-up, and for this reason, the magazine represents excellent value for money. To order one of these magazines, please send a cheque or money order for AUD $11.95 (includes $2.00 for postage) payable to Jeff Webster, PO Box 344, Labrador QLD 4215. Payment can also be made instantly by Visa or MasterCard using Paypal. Click on the link below to Buy It Now - or add it to the Cart (above left) to continue browsing. For more details, telephone (07) 5594-0898.
boats from Australia's leading builders. Fitting Out For Lake & River Fishing Has Sold Out. Please Do Not Order Copies Of This Magazine.